A series of interactive sound art installations situated in the greenhouse of the Brick Works, Alcampo’s singing plants are potted banana plants that respond to human hand gestures to emit soundscapes of Aboriginal chants, songs and spoken words. The project’s title “Visitors” calls attention to the insertion of these foreign flora into the otherwise completely native gardens of the Brick Works and raises important questions around responsible horticulture, embedded forms of knowledge and the importance of asking the land for permission to access its resources. In celebration of National Aboriginal Day, Jo SiMalaya Alcampo and friends will give a performance that features her Singing Plants installation as a live instrument. The afternoon’s activities will include traditional prayers, chants, and a participatory jam session with singing plants and indigenous instruments. Amy Desjarlais (nee Tabobandung) will open the event with an acknowledgement and prayer/drumsong. Amy will share the EarthTALKER Water Project and music from the Sacred Water Journey album. 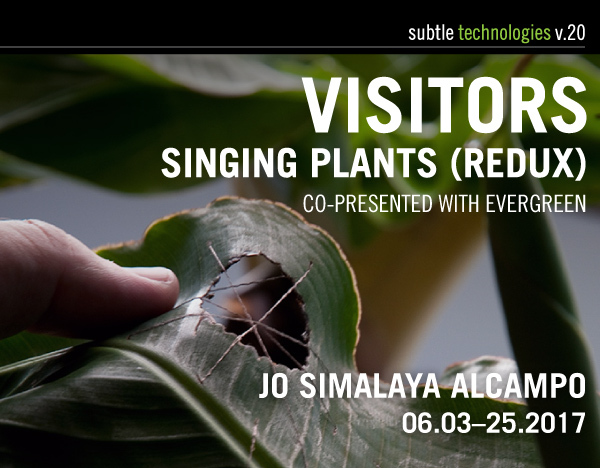 Jo SiMalaya Alcampo will talk about the Singing Plants and demonstrate how to play them. Kapwa Collective members will engage the audience in an interactive activity that embodies the elements of wind, water, air and fire. Kapwa Collective will introduce a set of gongs and teach rhythms passed on by Mamerto “Lagitan” Tindongan and other Ifugao Mombaki’s (shamans) from Bayninan, a village of Banaue in Ifugao. Kapwa Collective will invite Jo, Ester, Amy and the audience to join in a group jam session with singing plants and indigenous instruments. Ester Dulawan Tuldague is the Municipal Coordinator of Kiangan in the Ifugao Association of Canada, an association of Ifugaos working or residing in Canada, especially in the Province of Ontario.